Now that the holiday festivities are over, I am more than ready to get back to healthier eating. This contribution to “Healthy Sides” week starts off with the yummy goodness of sweet potatoes! It’s more than the usual roasted yams or whipped sweet potato, it’s a unique twist on a familiar veggie that will leave a big impression. The natural sweetness of the potatoes, the crunch of the pecans, combined with the added kick of the crushed red peppers creates an unexpected “party” at first bite! Taste and enjoy this delightful recipe that boasts a mere 207 calories and 25 grams of carbs per 1/2 cup serving. Preheat the oven to 425 degrees. While the oven is heating, toss the chopped sweet potatoes with the sugar, oil, salt, and crushed red pepper flakes and roast for 30 minutes. Saute the bacon until crisp and remove the fat, but leave the chopped bacon in the pan. Add the silvered red onions and saute for 3 minutes. Add the honey and vinegar until thoroughly combined. 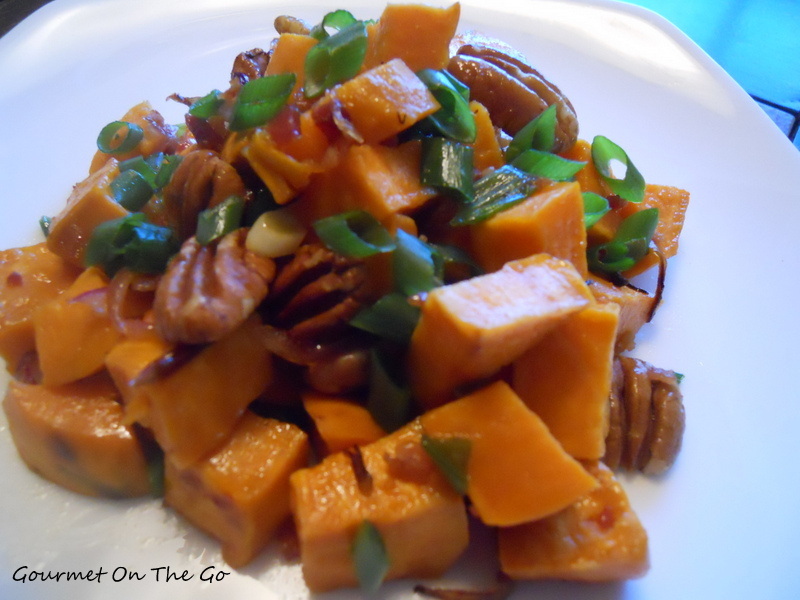 Place the roasted sweet potatoes in a bowl and combine the bacon mixture, pecans, lime juice, and scallions. Salt and pepper to taste!